As I announced in the seats thread, it's been a while since I trained properly. In this diary I'll describe my methods and progression from now on. Each post will focus on a particular aspect of chess. This one won't be digging a lot yet, and it's about opening. On 1.e4 : the sicilian (najdorf and Scheveningen mainly) and as a side opening the hippo. For now I'm playing the sicilian kalash but it's not a very good defense especially against a weaker opposition since it's not that hard to find lines heading to a draw. I still need to learn properly how to play the Najdorf and the Scheveningen as well as when to switch from the hippo to something else (since it's not playable if the opponent chooses to go for an extended center, in which case I'd need to switch to something like the Pirc, so one more thing to learn). on 1.d4 : the Hippo as the main defense (and again I don't know it quite well still), + KID&Grunfeld + Nimzo. I have some knowledge on the KID and the hippo doesn't need much knowledge. I know the basics about the Grunfeld and the Nimzo but many lines have me lost quite early so I'd need to study those. on something else : improvise trying to go towards one of the defense I play on 1.e4/d4. As white, I currently play the QG, the Catalan and the London system, and I think my knowledge there is quite good, even though on the closed Catalan I could get quite better. Against a KID/Grunfeld I like to play f3 systems with long castles, which is often effective and always fun so I'll keep it that way (I go for the anti-grunfeld if the opponent plays that defense). I'd like to be able to play "from both hands" so 1.e4 as well, but I'll study lines there only after all the other things (that includes all basic endgames are known, my tactical level has reached the goal I'll fix to myself etc). Looked at many lines for the Hippo and played 20-30 games as black with it since yesterday (in blitz). What I can say is that it's unplayable if the ennemy wanna have a extended center (d4 e4 f4 or c4 d4 e4) and so we should begin in such a way that we can transpose to another of our lines, e.g. 1.e4 g6 (best by test as far as playing the hippo goes) 2.Nf3 Bg7 3.d4 d6 (staying flexible, the hippo system is obtained once we have the a6-b6-c7-d6-e6-f7-g6-h6 + Bb7-g7 + Nd7-e7 set-up) 4.c4!? Nf6 (walking away from the hippo into a KID). The second point is tempo-related. The opening actually works by often giving back the tempo to the opponent, but in such a way that he DOESN'T HAVE MUCH TO DO WITH IT, I learnt the hard way that if you play without care the moves in whatever order you could enter some disastrous pin or pawnbreak quite fast, which you should avoid at all cost. I'm gonna try the opening tonight in an official game vs a 1800 Fide rated player, we'll see how it works at that level. must have looked like a mix between "$$*f!? !çczaioycnriyoaç!j" and "rofl "
- The hippo's a trash opening (albeit a GM would still destoy any sub 2000 player with it). - My knowledge of the plans in mainline openings is trash (in the "hippo" game, I somehow manage to salvage my position by transposing into a KID, only to play it like a retard). Player in the 1600 range knew better all the plans of the openings we were visiting, although I detroy them all in tactic shots and endgames. Still, having good positions from the opening AND knowing the plans to use in the position I'd get could be usefull. So I've decided to change my training program. I went back on doing tactical exercices and I will continue that, just not focus on that since my tactical level already nearly went back to my old "good" level. I'll do 5 tactical exercices a day, 3 endgame exercices and I'll add a lil bit : study one new opening line a week, going through Masters (and by masters I mean only contenders to the world title over the ages) games. Since I plan on switching to 1.e4 I'll begin with open games, and since to have a good motivation a bit of fun is always good, I'll start with the King's gambit ! If you have any game to suggest in that opening or an opening to suggest for next week, be my guest ! It has a huge library of openings and examples. I am using it to improve my openings since I am not always free to deeply research openings, and sometimes simply want to know the lines by heart. This has helped me well so far. I would suggest you try it out. Today in team competition I beat in a complicated game where I played an imprecision move 23 going from equal/slightly better to slightly worse, then my very first move of the endgame was a little mistake, played too fast, and move 36 a mistake my opponent didn't use, and then in and endgame where black should be the only one pushing for a win (and the normal outcome would be a draw) my opponent blundered and I took the chance off the bat. The guy was a 2050 player so it's a good result, and the team won the encounter, so all is good. Coming back on my comment, the hippo is a quite bad opening, but it's actually not that clear how to win against it, highlighted by the fact I drew an IM (2380 FIDE rated) as black today with it in an irl tournament. performed at 2100 so it was fun practice. Went 1.5/3 with black and 3/4 with white versus an opposition averaging a little more than 2000. So yeah I also obtained a great position with it last friday versus a 17xx guy. It's not suitable in all situation but it is flexible and since I play mainline opening in a shaky fashion for now I'll include it in my repertoire. This week's opening is the grunfeld (black side). As a concequence we got into a Saemich KID, in which I found a good timing for sacrificing my LSB. For some unknown reason he declined to take the bishop back and as a result I was a pawn up with black as soon as move 11. I increased my lead until arose this position, in which I ended the match with a pretty (albeit not that hard to see) tactical shot. Can you find it aswell ? 1... Qxe4 2. Rxe4 Rxe4 wins the queen because if 3. Qxe4 then 3... Nf2#? Can't see anything else. That's the good answer indeed. The game went 1... Qxe4 2.Rxe4 Rxe4 3.h3 Rxd4 4.Nxd4 Nf2+ 5.Kh2 Bd7 and he resign a bit later. 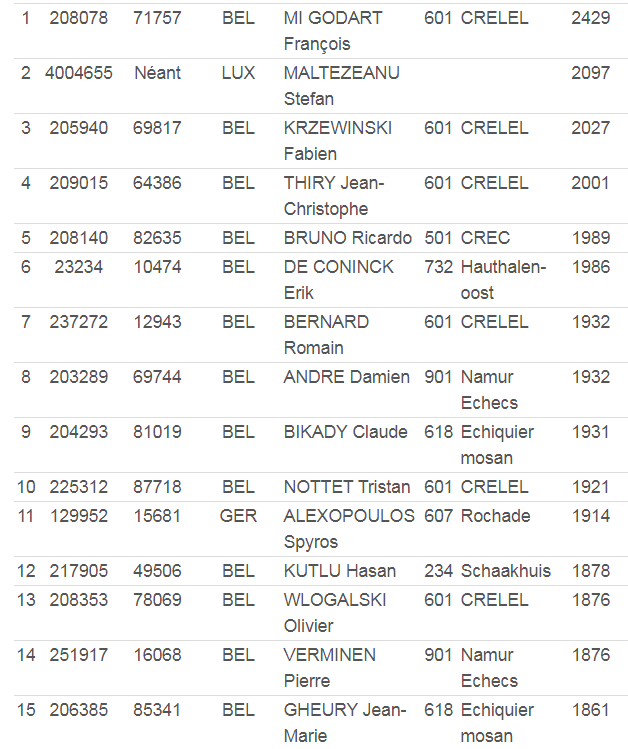 This is the 15 top seeds as for now (some additional players will come for sure during today's inscriptions). If no other player comes who's better than the current second seed, then the second place of the tournament will be the target. so yeah a weak tournament till now but still 4 rounds to make something good come from it.